What goes through an elite runner's head during those 26.2 miles of pavement. 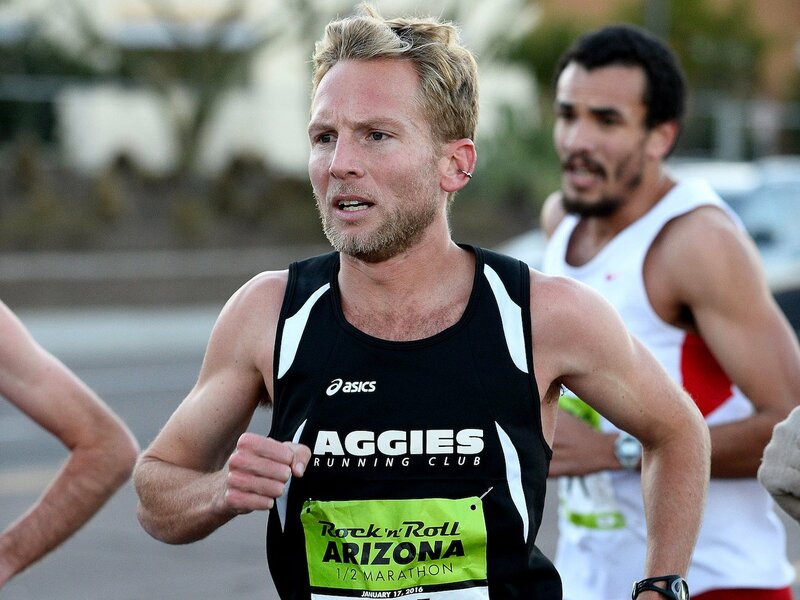 Scott Bauhs competing in the Arizona Rock 'n' Roll Half Marathon. Courtesy of Photorun.net. The 30-year-old became the youngest American to complete both the 4-minute mile and the 28-minute 10,000-meter run in 2008 while at Chico State, and went on to race in the 2011 World Track and Field Championships. The Asics-sponsored athlete keeps a busy schedule: He raced the USA half-marathon championships in Columbus, Ohio earlier this month, celebrated his 30th birthday the following week, and is headed to New York for the annual UAE Healthy Kidney 10K on May 14. Out of breath just hearing that? Business Insider spoke with Bauhs about motivation, the mental side of running a marathon, and what goes through an elite runner’s head during those 26.2 miles of pavement. 1. Don’t zone out — think about the race. How do marathoners pass the time? Anyone who hasn’t run a marathon might assume runners are zoning out, daydreaming of beer at the finish line or a triple-cheese pizza waiting on their kitchen table. Not the case, according to Bauhs. While it does depend on the runner and his or her motivations, Bauhs says many serious runners are spending most of the race thinking about their pace, hitting splits, and monitoring their competitors. “For the most part, I’m not thinking about much outside of the race. I’m ignoring just about everything except for the road in front of me and the guys around me, and then trying to assess how I feel and pay attention to the course,” he says. Bauhs doesn’t listen to music when he runs. He’s never actively trying to zone out when running, he says, because he has to be focused, at least somewhat, at all times. 2. Tune out distractions by sizing up your competitors. “When there’s a crazy-looking person screaming and waving signs on the side of the road, or when you run through New York and you run by Times Square, you can’t help but notice big landmarks and people like that,” Bauhs says. How does he stay focused with crowds of people shouting, ringing cowbells, and offering high-fives for 26 miles? He assesses the competition. Staying with a pack running at a pace close to his own is key in a marathon, Bauhs explains, so he’s constantly trying to assess whether he’s running next to the right people. He looks at runners’ posture and how they’re holding their arms to judge their physical condition. 3. Focus on the hard work you put in to stay motivated. For Bauhs, watching a cluster of runners pull away from him and being unable to respond physically is one of the most mentally difficult moments in a marathon. He says it’s hard to stay focused on putting his best effort forward and fight the urge to give up when this happens. What motivates him to keep going when he’s exhausted or feeling defeated? “For me, it’s all the hard work that you put into it, and again, knowing that the goal is just to get to the finish line,” Bauhs says. 4. It’s more important to finish hard than start fast. “I’ve never gone out too slow in a race before, but I’ve certainly gone out too fast many, many times,” Bauhs says. Runners can often make up a lot of ground in the last 8 to 10 miles of a race if they’re feeling good, he explains, stressing the importance of staying relaxed and being patient through the beginning of a race. 5. Try to relax as much as possible. When Bauhs starts overthinking and worrying, races tend to be a little bit tougher, he says. When he goes into a race very relaxed, it’s a completely different — and much smoother — experience. In the most physically and mentally challenging moments of a marathon, he’s trying to stay relaxed and always remembering one very important thing — how grateful he is to be doing what he loves.